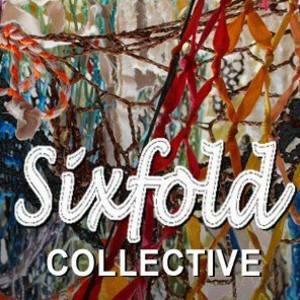 Sixfold Collective is comprised of a group of artists who work individually in a variety of disciplines that include painting, printmaking, sculpture, fiber arts, and mixed media installation. Their collaborative projects bring these different skills together to create something new. The artists are drawn to the potential of a group being able to accomplish something different than an individual might accomplish, incorporating the skills, resources and perspectives of each person. The work presented here on Saatchi Art is primarily collage, where each piece was passed around and worked on by different artists. Each person had complete freedom to leave things alone or revise as they deemed necessary. The whole group would then vote when a work seemed complete. Collaborating artists are Terri Dilling, Amandine Drouet, Susan Ker-Seymer, Leisa Rich, Ann Rowles, Corrina Sephora Mensoff and Susan Cipcic. (Terri Dilling and Leisa Rich on Saatchi Art too). New installation of the net form in storefront space, part of the Urban Fronts events. Collaborative installation of a net form as a Lair, using yarn, fabric, rope and a variety of found and recycled materials. Exhibit contained collaborative and individual artworks. Outdoor installation of converging net forms, using yarn, fabric, rope and a variety of found and recycled materials. Art Walk with kids from Create Your Dreamsthat provides kids an opportunity to see and discuss a variety of artwork installed along the Beltline and to create a temporary artwork from found materials. Six artists collaborating as the Friendship Project received funding to develop a project that stemmed from notions of “Friend” and “Ship”. The project included a collaborative work and individual work. The project resulted in an exhibition that included a large sculptural boat installation, collaborative paper patchworks, and fabric wall quilts that incorporated prints created by the broader community in a workshop that the artists organized.